Recently I met with Public Libraries Victoria Local Studies colleagues to tour the new Newspapers and Family History Reading Rooms space at the State Library Victoria. The 2020 Redevelopment project will result in revitalised spaces including a new gallery space. Entering via the new Russell Street entrance our guide informed us that only one third of the library is currently open. 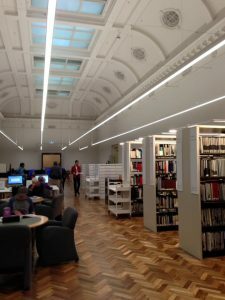 Since that tour the La Trobe Reading Room and dome galleries have been opened after being closed for construction works. 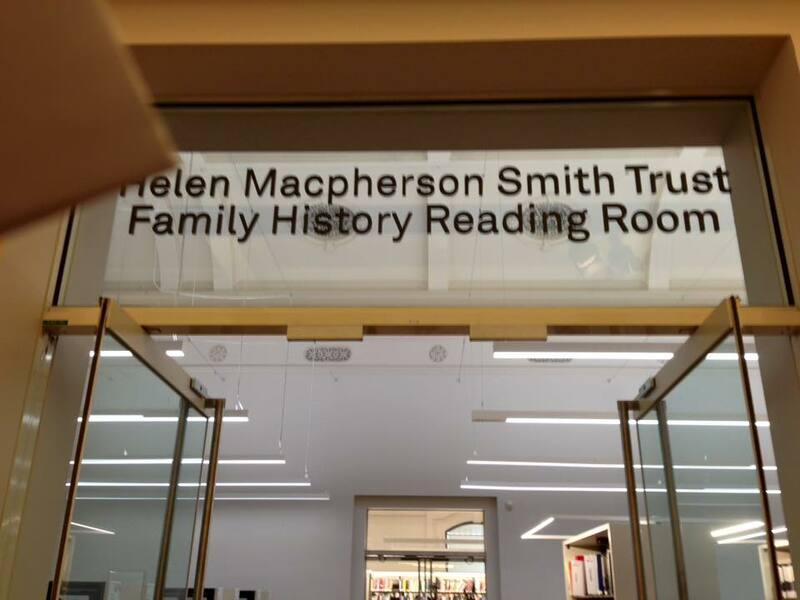 The Newspapers and Family History Reading Rooms are easily located in the ground floor and staff note it is a quieter space than previously. Library visitors can easily access Australia’s major daily newspapers and some international papers where they are kept on open access for three months. Older newspapers are available either on microfilm or in hardcopy. Researchers are still encouraged to join the library but cards are no longer issued. Researchers need to keep track of their unique barcode number instead. A genealogy collection invites people to browse as it is arranged by location, and even more specifically in some cases, such as counties for the United Kingdom. 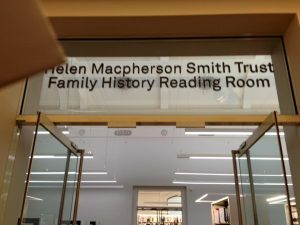 Staff are keen to collect British and Non-British items often published by family history Societies to boost the collection. 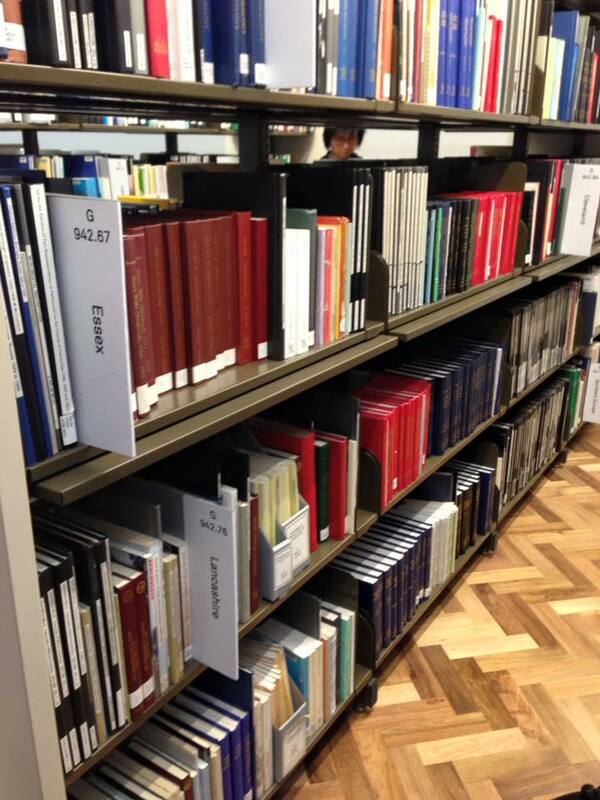 A recent effort has been made to focus on resources for genealogy and children. The Australian collection focuses on resources for each state as well as theme based such as occupations. Researchers need to be aware of course that they have the whole State Library collection at their disposal and subject needs may be reflected in other parts of the collection. Staff are on hand to direct researchers. Newspapers on microfilm fill a number of white cabinets which are arranged in alphabetical order by place name. (Check first that the newspaper and time period that you are after may be accessible via Trove). A card index to local newspaper is available (some references here have also been added to the Australiana Index . The two most comprehensive card indexes in the room are Herald, (Melbourne), Jan. 1926 - 12 Nov. 1970 and Sun, (Melbourne), Jan. 1929 - 12 Nov. 1970. A page about the indexes is included on the How to find things in newspapers research guide . The SLV’s Online index to published sources of information about people, places, organisations and events in Victoria. Staff are finding a big part of their jobs is to assist patrons find living people. Popular resources include passenger lists, UK census, IGI (International Genealogical Index), cemetery records, probate records, convict records and phone and post office directories. Electoral Rolls for Victoria and some other states are available to 2008. A microfiche collection also fills in gaps from information available online. The space includes a number of computers which retain older operating systems so that some CD Rom resources such as the Digger format indexes can still be accessed. There is much to explore via the SLV website and even more so if you are onsite. From the home page hover over the tab “Search and discover” – then specifically “for family historians”. Links include recommended resources and family history research guides. Some resources can be accessed at home with the SLV library card (or barcode). Guides provide introduction to topics and often include links to other agencies, archives and libraries that have collections. Feedback is welcome.